An incredibly useful feature was slipped into the Drupal 7.33 maintenance release - theme_debug. This handy little variable can greatly reduce the frusteration of chasing down template files, and avoid the need for heavy modules, like Devel and Devel Themer. After hours of searching Google, lots of trial and error, and a bunch of grumbling, I had a breakthrough and finally figured out how to get Source Maps to work under Chrome and Compass. The problem is that this functionality has been around for over a year in various forms in the pre-release versions of Sass and Chrome. As such, many of the posts I found were out dated and didn't work with the current, stable versions. So this post is partially to document the process for myself (and a small victory lap! ), but hopefully someone else will get something out of it. 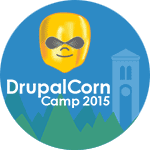 Only a month to go before DrupalCorn! 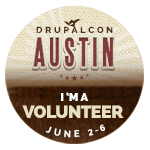 To be honest, I am probably looking forward to this event more than I was to DrupalCon Austin. The site was relaunched running on Pantheon today! A big thank you to Pantheon for hosting the site as part of their "Give Back" program that provides free hosting to Drupal sites that support the community. This is the second site I have launched on Pantheon. The first was a new site built from day one with Pantheon in mind, the experience was great. This site was imported from a previous build, running multi-site under Aegir. There were a couple bumps, but it still was a great experience. I just received confirmation that my DupalCorn session, "Sass/Compass: Or How it final clicked and I learned to love preprocessors" has been accepted! Pretty excited and a bit terrified, as this will be my first time presenting at a camp. There is a lot about Drupal that is pretty awesome, upgrades and content migration don't top the list however. Trevor James's new book, Migrating to Drupal 7, is published by Packt and takes a look at a couple ways of getting existing content into Drupal. The two most common ways are the Feeds module and the Migrate module, both are touched on. 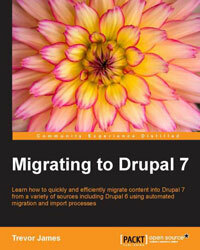 Additionally the Drupal 6 to Drupal 7 upgrade preocess is covered, as well as importing content into Drupal from Wordpress. A work in progress- The development environment is one of the first key elements that is required to do anything with Drupal or web development in general, your work needs a place to live. This series will cover a variety of development environments that are suited to Site Builders, Themers, and anyone getting started to Drupal. They range from the super simple to fairly advanced, so there should be something for everyone and no need to be intimidated. There has been some behind the scenes work going on and HackMonkey.com is now running on an NGINX webserver. Read more about A New Home! Don't worry, the HackMonkey isn't going to steal your credit card, or hijack your toaster! 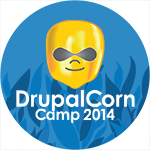 The goal is to share just how far Drupal can go without having to crack the code...much.